The Lehigh Valley Toyota Dealerships will be collecting non-perishable food items this holiday season, during the 2nd annual Lehigh Valley Toyota Tundra Food Drive in support of local food bank, Second Harvest Food Bank of Lehigh Valley and Northeast Pennsylvania. 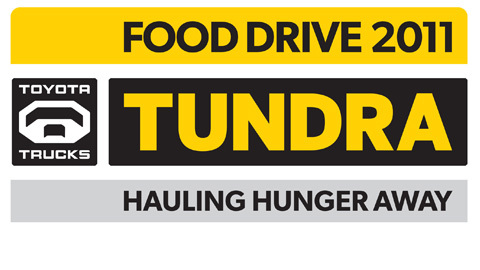 The 2011 edition of the Lehigh Valley Toyota Tundra Food Drive is scheduled to culminate on Monday, December 19 at 11:30AM, when a convoy of Toyota Tundra pick-up trucks will deliver the collected non-perishable food items to the Second Harvest Food Bank warehouse in Allentown. Included in the Lehigh Valley Toyota Dealers is Krause Toyota in Fogelsville, Bennett Toyota in Allentown and Milham Toyota in Easton. When asked about the importance of the Tundra Food Drive Milham Toyota Owner Kurt Koch stated that "It is very important to the Lehigh Valley Toyota Dealers that we put our best efforts in supporting hunger relief initiatives in the Lehigh Valley. We are so proud to be working hand and hand with our partner the Lehigh Valley IronPigs, the local media and the great people at Second Harvest to ensure that everyone has the opportunity to get a warm meal this holiday season." The Lehigh Valley IronPigs will be supporting the 2011 Lehigh Valley Toyota Tundra Food Drive by way of food collection and providing special appearances by Lehigh Valley IronPigs mascots. "We are thrilled to partner with the Lehigh Valley Toyota Dealers to support Second Harvest Food Bank this holiday season. The Toyota Tundra Food Drive is a great opportunity to help those in need in our local community; we encourage our fans to participate by bringing donations to their local Lehigh Valley Toyota Dealership or the Majestic Clubhouse Store at Coca-Cola Park" said Lehigh Valley IronPigs General Manager Kurt Landes of partnering with the Lehigh Valley Toyota Dealers in the annual food drive. Second Harvest Food Bank of Lehigh Valley and Northeastern Pennsylvania provides food and grocery products to more than 66,000 individuals each month through a network of more than 200 member agencies. These agencies include emergency pantries, soup kitchens, shelters, and child care, rehabilitation, and senior citizen centers. "Donations from community food drives provide much needed variety to the product that we can offer to our members. Variety is not only the "spice of life," it can lead to improved nutrition for program participants. We greatly appreciate the Lehigh Valley Toyota Dealers contribution to our efforts to end hunger" said Ann McManus, Director of Second Harvest Food Bank. "As a proud member of the Lehigh Valley Toyota Dealers we are honored to donate food to Second Harvest Food Bank during the Toyota Tundra Food Drive" said Chris Zerfass, General Manager of Bennett Toyota in Allentown. "Second Harvest Food Banks mission aligns with our desire to help people in need of food and to distribute that food right here in the Lehigh Valley." These thoughts were echoed by Bob Krause, Owner of Krause Toyota in Fogelsville who insisted that "the Lehigh Valley Toyota Dealers are very proud to be a driving force towards hunger relief in the Lehigh Valley. With the support we have received from our customers we are excited to have collected supplies for Second Harvest Food Bank. We are hopeful that this will make a difference in the lives of Lehigh Valley residence in need and for better times ahead." The Lehigh Valley Toyota Dealers is comprised of Bennett Toyota in Allentown, Krause Toyota in Fogelsville and Milham Toyota in Easton. Second Harvest Food Bank of Lehigh Valley and Northeastern Pennsylvania is located at 2045 Harvest Way in Allentown.